Parkway @ 700 | Flickr - Photo Sharing! 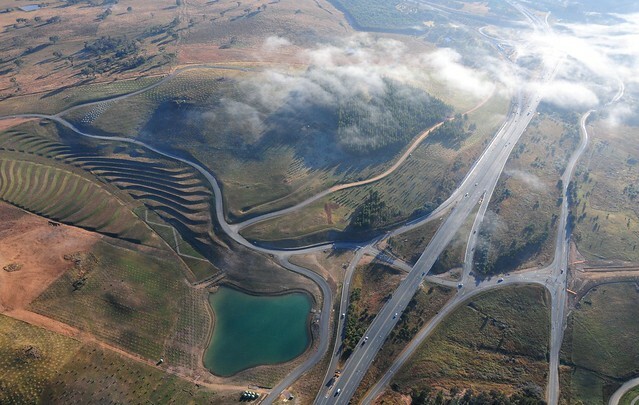 700m altitude over Tuggeranong Parkway reveals the fast evolving/expanding National Arboretum and the convolutions of the already infamous GDE! piedbutcher, flshgvbails/d fo;dwq, and 3 other people added this photo to their favorites. a777, many folk will be 'pushing up daisies' by the time this Arboretum is finished so if they 'plant greenies' maybe they can meet in the middle? No room for a National Arboretum on the Gold Coast, too many golf courses and nursing homes! That's a classic intro "The country is going broke..."
a777 - there's a lot more thought gone into it than you suggest. I for one look forward to a fantastic recreational and educational facility, it's the best thing our ex-chief minister's government has done. About time a politician showed a bit of long-term thinking and started building something that will take more than an electoral cycle to finish. On the other hand ... about the GDE - THAT you can have a field day on -- stupidity in spades. Starting with millions wasted in building it unduplicated and ending with a sculpture of some grass that cost $700,000, a sculpture that has no redeeming features apparent to any normal person. Or maybe it has? Is it only an accident that this mass of tangled metal reminds us of the nearby bridge that collapsed during construction. Worryingly prescient.